Do You Want toReduce fire hazards in your home? Do You Want toSave money on your electric bill? Do You Want toSave money on appliance repair and replacement? Then You NeedThe Dryer Vent Dude! 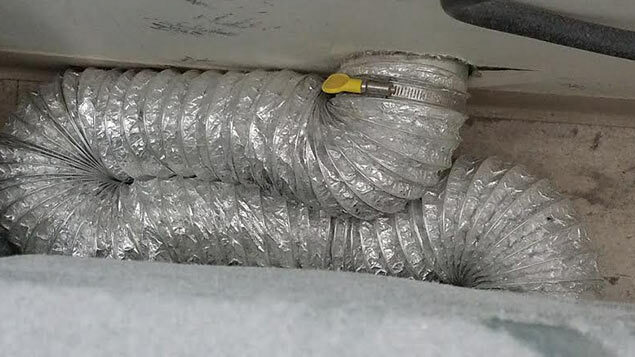 Dryer vents should be cleaned once a year. Depending on the dryer, it’s frequency of use and the length of your vents, your unit may require more frequent attention. 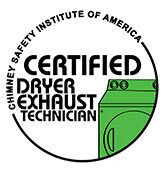 Did You Know That A Clogged Dryer Vent Is Dangerous? 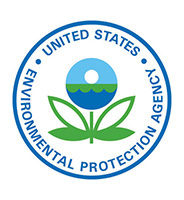 According to the U.S. Consumer Product Safety Commission, more than 15,000 fires are started every year by dryers. 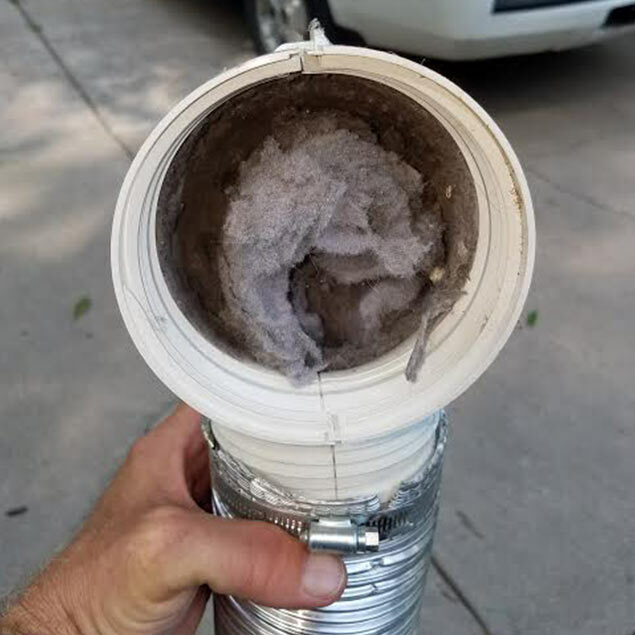 Lint and other harmful debris can build up in your vents, reducing air flow, backing up dryer exhaust gases and creating a fire hazard. Your dryer is designed to get rid of the heat and moisture it builds up while working. If that heat gets trapped, it forces your unit to drastically overheat and work itself harder without actually drying your clothes. This excess heat is what can lead to a dangerous fire. 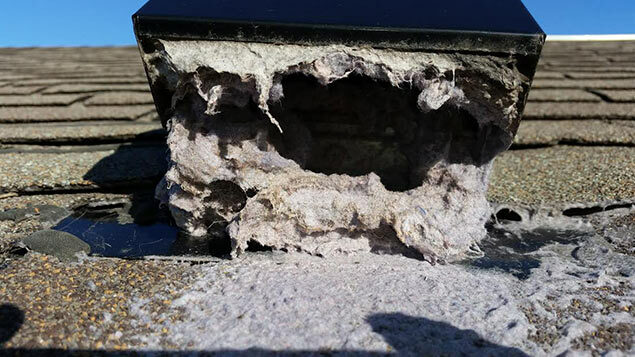 This roof termination is badly clogged with lint and must be cleaned. More often than not, your dryer is pushed as close to the wall as possible. While creating a flush look and aesthetic appeal, this instantly slows the flow of air and creates a pocket for lint to gather. This can be remedied by ensuring your transition duct is the proper length and within approved regulations. 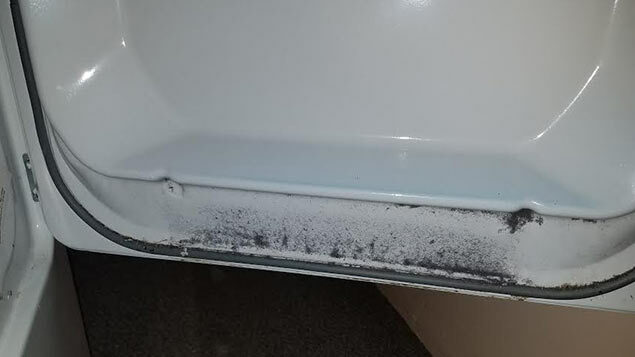 Lint build up on your dryer door means that there's lack of airflow in your vent system. 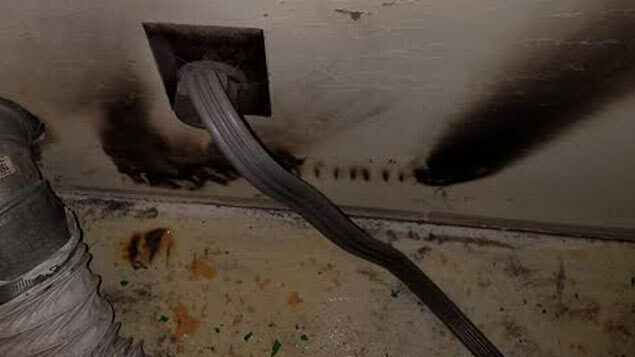 Inferior dryer vent connector that had combusted due to the lack of air flow. Your vent should be regularly checked and serviced. If it’s been at least a year since your unit was last checked, you could be at risk of a fire and not even know it. Don't hesitate to call the Dryer Vent Dude today! We provide high-quality service that not only saves you money but can maybe save your life. The Dryer Vent Dude genuinely cares about your family’s safety and well being. Founder Steve Schwaller Jr. delivers a meticulous attention to detail to ensure every job is done properly the first time. By providing high-quality service at an affordable price, our passion for taking care of our valued clients is evident. To Steve, family is very important, both his and yours. As the years go on, businesses grow and mature like a family, and like a family, they need lots of love and dedication to succeed. That's why we give our all to both each and every day!